“Typically, our clients are at Point A and want to go to Point B. We help them get there. 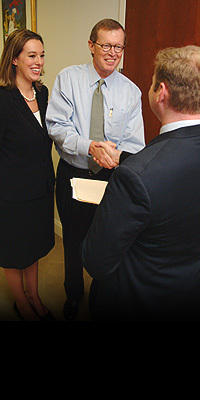 Stephen Bradley & Associates is Alabama’s first full service public affairs firm. And it is the best. Our highly specialized firm combines the management of public relations issues with expertise in governmental, regulatory and legislative affairs. In effect, we offer one-stop shopping for clients, and we are able to provide those services in a more cost-effective manner because out-placement is simply cheaper than in-house overhead. Some clients require just public relations services, while others need only governmental/legislative expertise. However, many have issues which demand expertise in both specialties. That’s when one firm is head and shoulders above the rest. With more than 100 years of highly successful combined experience from a seasoned staff, Stephen Bradley & Associates offers a creative, yet pragmatic approach to solving client problems and helping clients achieve goals. Strategically timed to coincide with the move away from large scale internal corporate and trade association communication departments, Stephen Bradley & Associates fills a vital niche by offering clients services ranging from public relations, research, and media relations to crisis communications, grassroots organization, and strategic communications planning in addition to governmental and legislative relations.